Well, Christmas is over for another year, and I am still recovering from the festivities! I thought I would share with you instructions for the Finnbair inspired pieces I was doing on the Crafters Cupboard stand at Paperiffic. I have turned some of these into journal covers. 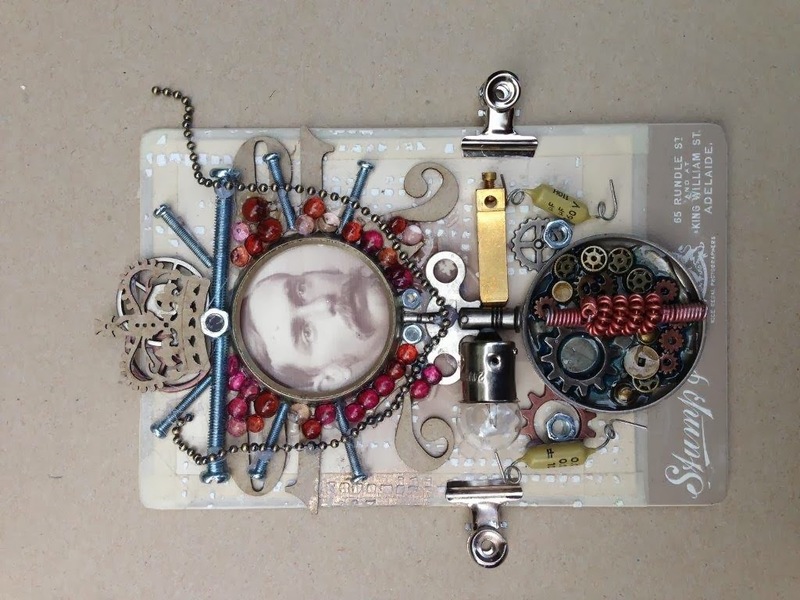 · A small piece of book board or a cabinet card if you have one. · Discarded bits of lace. 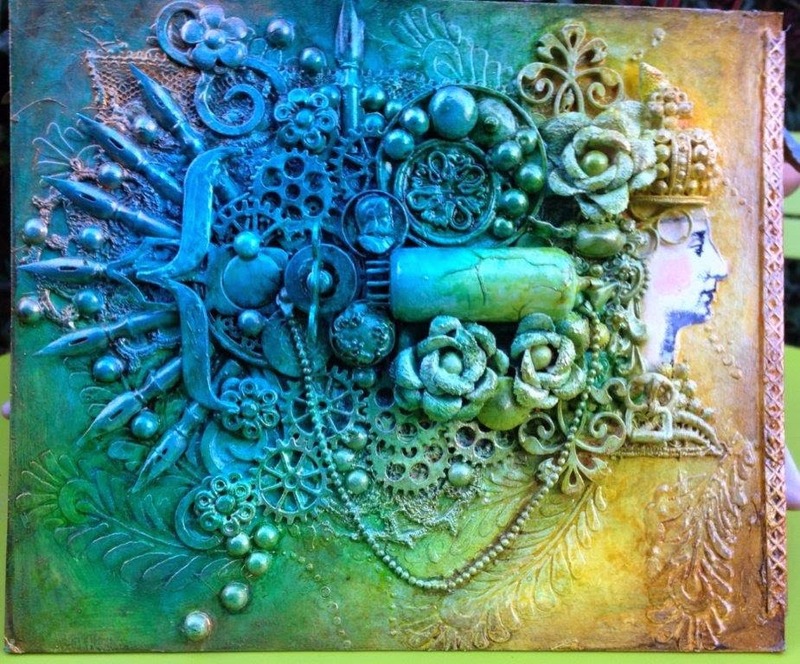 · Bits and pieces from your stash – buttons, old bits of metal, laser-cuts, cardboard letters, ball chain –anything that has shapes you like. Colour is not a problem. · Glossy or Matte Accents. 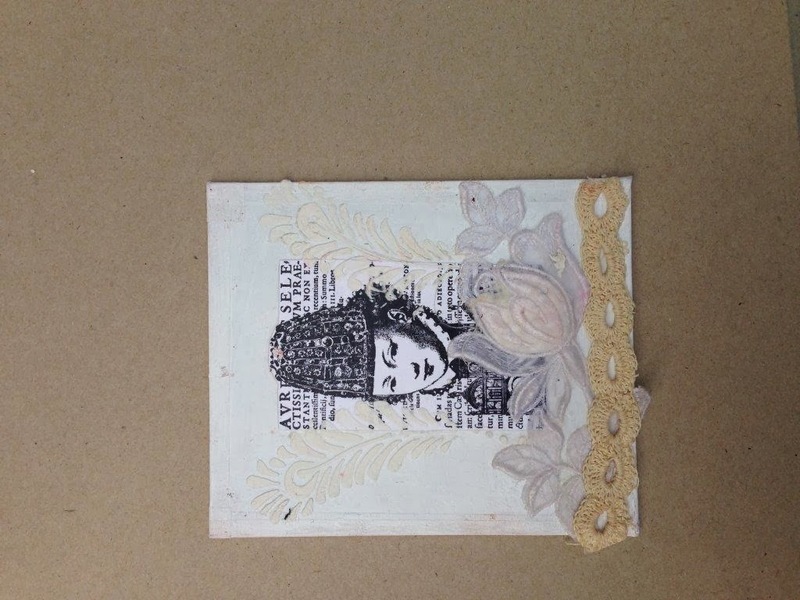 Use masking tape to completely seal the edges of your piece of book board or cabinet card. Stamp your face stamp onto card cut out and adhere to your board. 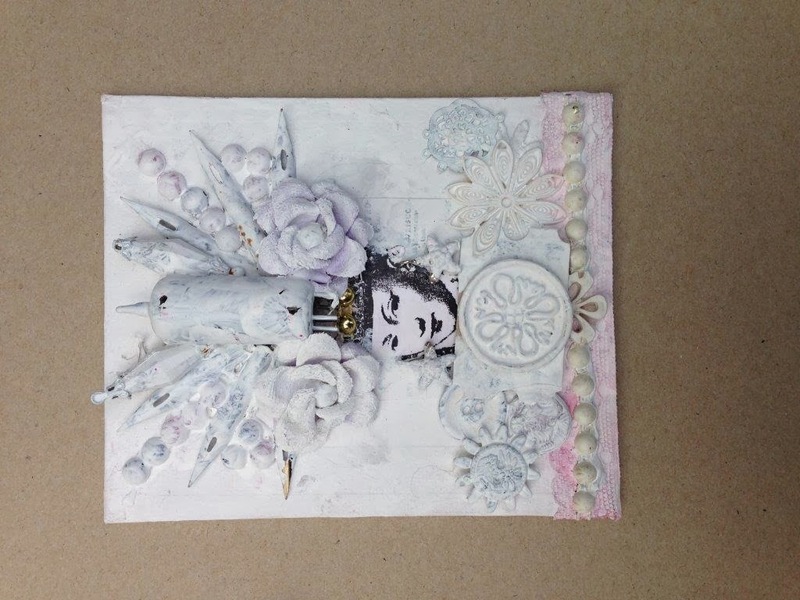 Use grunge paste through your favourite stencils to add base texture onto the board and the card. Adhere lace or other fabric as desired. Dry thoroughly. 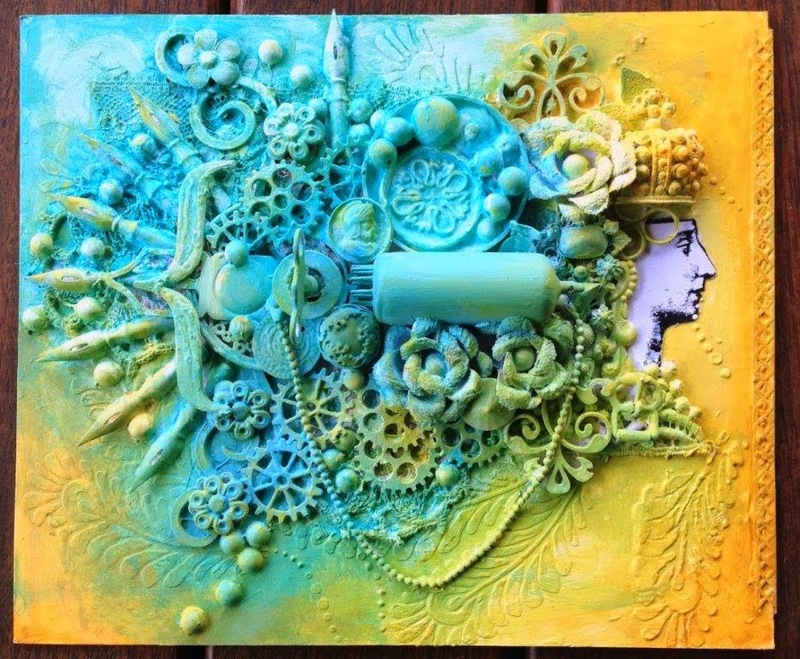 Arrange elements from your stash in a pleasing design, focusing on the shapes. Adhere with glue gun for the major elements, and smaller elements with glossy of matte accents. While the picture below is from a different project, it gives you a good idea of how to lay out your elements. The colours are irrelevant as you will see in the next steps - it is the design that matters. Protecting the face with a piece of paper towel or a baby wipe, cover the entirety with a couple of coats of gesso, ensuring that as much of the colour is eliminated as possible. Dry thoroughly. Using your chosen fresco paint colours, (I have used zesty zing and mermaid) put colour onto the piece in sections, blending thoroughly at the edges. Make sure that you get the paint into all the nooks and crannies. Dry thoroughly. Using similar colours in dylusions, thoroughly spray and mix over the piece to heighten the colour. I did 2 coats, heat drying the first (that helps to crack the gesso and paint), and then let the second coat puddle into the back of the pieces and letting it air dry. This helps to add depth. Use treasure gold to add highlights. Add a little colour into the face with acrylic paint (cheeks & lips). Spray with fixative to seal the dylusions before covering the whole with a glossy varnish to completely seal.